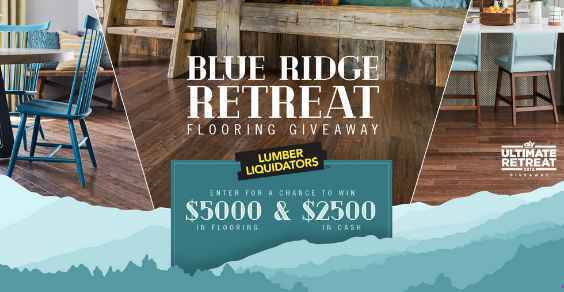 Enter the HGTV Lumber Liquidators Blue Ridge Retreat Flooring Giveaway for your chance to win a gift certificate redeemable for $5,000 in flooring products from Lumber Liquidators and $2,500 cash prize. How To Enter: During the sweepstakes period go to this link:hgtv.com/blueridge and follow the online instructions to register by entering all information requested on the registration form and once you filled out the entry form now Click on the submit button to complete the registration form. Prizes: One grand prize winner will receive the following: (i) a gift certificate redeemable for $5,000 in flooring products from Lumber Liquidators, Inc.; and (ii) a check for $2,500. ARV of all prizes is $7,500. When To Enter: The Sweepstakes entry begins at 9:00 a.m. Eastern Time (“ET”) on August 6, 2018 until 5:00 p.m. ET on September 26, 2018. Who’s Sponsor: The HGTV Lumber Liquidators Blue Ridge Retreat Flooring Giveaway is sponsored by Lumber Liquidators, Inc., 3000 John Deere Road, Toano, VA 23168.